Mats, Ecoglo & much more..
JustMats is a third generation 100% Australian private family owned business specialising in the manufacture and design of access, mobility and safety solutions. JustMats is committed to ensuring prompt delivery of engineered solutions for Government, architects, builders and installers throughout Australia. JustMats product range has expanded from the GECA and ecospecifier certified RolaDek matting system and the ecoglo range of glow in the dark stair nosings, guidance and contrast strips and signage. Our mission is to exceed customers’ expectations. We have a commitment to improvement that develops partnership-style relationships with our flooring contractors and builders and provides expert advice to the architectural industry. 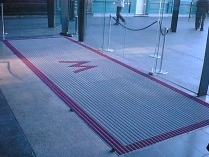 Through the provision of superior products, service, and with a strong suit in research & development, JustMats will provide a complete range of aesthetic, effective matting solutions and safety stair nosings to meet every application & budget, complying with Australian OH&S standards. We act with integrity and honesty in all our business dealings. Our workplace is founded on strong teamwork, trust, mutual respect & encouragement where employees accept responsibility, accountability and receive recognition. We expect strong profitability from an enterprise that provides the finest service, based on the highest standard of ethics, values & client care. We are accountable to our directors, shareholders, staff and customers and remain totally committed to producing superior results. Our manufacturing plant is located in the outer Sydney suburb of Riverstone. Our reputation as an excellent solution/service provider, is enhanced by the continued use of our products and services by some of Australia's largest building contractors.